As the title clearly hints to this is the third post in my superhero bulking journey series. So, if you just landed on this and want to start from the beginning click here for part 1. And here is the link if you for some reason want to read part 2 first. I am a little bit more than 2 months in the program now and the total duration is 8 months. However, I have been “incredibly unlucky” and I injured something around my neck or shoulder or both. I have not been able to do any pressing movements for close to one month now. I am not sure what caused the injury in the first place. I first noticed a little bit of pain while doing bench-presses but I dismissed it as being a small problem because I had slept in a bad position on a thin mattress the night before. But I was not so lucky and I had a sharp pain in the tissue around my shoulder for several days after and when engaging my shoulder. My best guess is that I did something wrong while doing face-pulls which initially exposed my shoulder. Ironically I do face-pulls to ensure that my shoulders are healthy and balanced. This is super important because you can develop imbalances over time especially when you do a lot of pressing movements. Imbalances can eventually lead to shoulder injuries like rotator cuff tendinitis or impingement which causes pain and swelling in the shoulder muscle, bone and the tissue around. It is often caused by repeatedly performing bad movements rather than a single movement. This is the problem I have now and I don’t only have pain but I have also become tighter in my shoulder, neck, and traps. Pressing movements are a cornerstone of most weight training workouts and the superhero bulking program is no exception. Because of that, I haven’t been able to follow the program and I basically have had to put it on hold. I have still gone to the gym (of course) and I have done different exercises for my back and legs like weighted pull-ups, cable rows, Romanian deadlifts, one-legged squats and some abs work. I have decided to lower my calories to be around maintenance as I am doing fewer compound exercises now. I am simply not interested in taking in a surplus of calories when I am this limited in the exercises I can perform. Because of this, it makes more sense to me to put the program on hold until my shoulder is fine again. At this time I don’t know how long it will take, but hopefully not too long. I have been considering whether I should do the program over from the beginning or if I should continue from where I left off. I haven’t decided yet. I will see how long my recovery takes. Because of my pain and fear of slowing down my recovery I am refraining from doing any pressing movements. I do shoulder stretches and neck stretches daily. I think it is working but the tightness is very stubborn. I also do movements to strengthen my muscles on the shoulder blades. The one I found most practical and I believe works the best is the lying shoulder external and internal rotation. You lie down on the side placing your upper arm on your torso forming 90 degrees angle with your forearm and then externally rotate your shoulder. Another one I like is an exercise I have read referred to as wall-angels (probably has many other names). You stand upright with body and arms close to the wall and then push arms upwards like you are doing a dumbbell overhead press but keeping the arms close to the wall all the time. I have of course been researching and trying a lot of exercises in the hope of being able to retain some of my strength and muscle. The only exercise I have had luck with is one called pinch press/plate press, which I am able to do mostly pain-free. While standing up you press/pinch together two or three smaller plates or one bigger plate in front of you at about chest height. Then you then push your arms out while pressing the plates together between your hands. It is an interesting exercise because you can actually hit the chest quite hard while putting very little strain on the shoulders. I can highly recommend it if you have some shoulder pain. Here is a video of the exercise. When I am no longer doing pressing movements I am left with both time and energy to do other exercises. Also by focusing on other exercises to progress and improve on I feel better about not being able to do presses. I thought to myself that it is time to focus on getting better abs. I haven’t followed a real abs program or done a lot of isolated ab movements for a long time. It has mostly been once a week and it hasn’t been very intense at all. Surprisingly enough you can have still have decent abs while training them once a week because they also get worked by doing heavy compound movements. Performing these movements well and with a lot of weight all require a tight and highly engaged core. In the past, I have followed two different abs programs. One is the Specforce abs, which is a paid program that I have also reviewed here on my website. You can check it out here. The other one is a free abs program by Rusty Moore from Visual Impact Fitness. Both programs are great in my opinion. However, specforce abs is definitely much more beginner friendly because it has a super simple and very solid progression plan. Progression is simply almost inevitable when you follow the plan laid out. In this case, progression means better abs. I chose to follow the program by Rusty because it focuses on doing a lot of leg raises which doesn’t hurt my shoulder. You can check out his program here. As mentioned above I have put the program on hold. But anyway here are my body stats and pictures. My bodyweight has gone from 67.5 to 68.7 kg. I live in Beijing and we are currently celebrating Chinese New Year in China, so I have probably been in a small surplus the past few days. If I look back in the week before I really stayed almost the same in weight which is intended as I have decreased my calories to maintenance. As the weather has become less cold in Beijing I will be starting to walk more as usual. I like walking and I believe it is a great way to increase daily energy expenditure while being relaxed. I think it is awesome to incorporate in weight loss which I write about here. My waist circumference has stayed the same and is about 77.5 cm. Hello my name is Eric, I will be starting in a online Tv series in 4 months. which means i have four months to look my best, i have been lifting for about a year and half now. 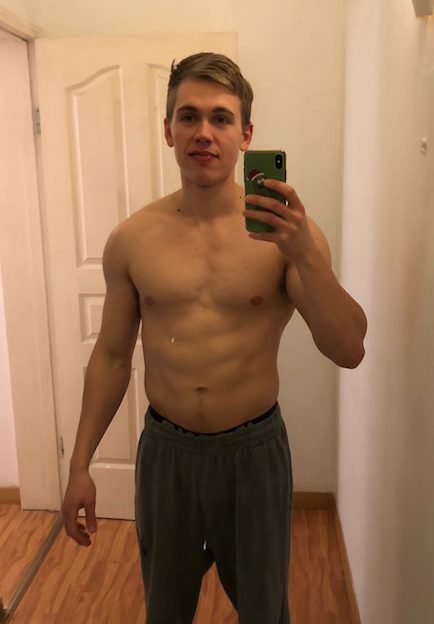 Im at about 15% body fat, 5’8″ about 140lb, I haven’t really had ab training workouts, Which program do you recommend for putting on muscle and building abs in about 4 months ? Sounds awesome with the online tv series! That is nice motivation to look great. Since you are commenting on this review I assume you are referring to which Kinobody program I think you should choose, or am I wrong? Now, 4 months is plenty of time to do that, but if you want to look your best you don’t want to end your cut just when you are about to start shooting for the show as you will have “concentration camp” look. Your muscles will appear flat after some time cutting especially at the end. This will change after some time once you start eating more calories again. How long I cant say but probably at least 1-2 weeks. There are many programs you can follow for your cut, the main concern is maintaining muscle mass while burning fat and not feel completely miserable. I talk about this in another post where I also include a workout routine. If you want a premium workout program to do this, I would recommend visual impact muscle building by Rusty Moore. He was actually Gregs fitness business mentor. You can check out his program here, which by the way is more “all-inclusive” compared to the Kinobody programs and it is cheaper. So the program goes in-depth on both how to burn fat while retaining muscle and also how to lean bulk. For an abs program, I would honestly say you can follow the free abs program by Rusty Moore which is awesome and also what I do.